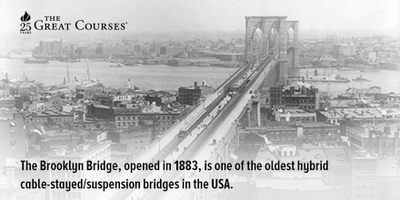 Our world is filled with structures that have stood the test of time. 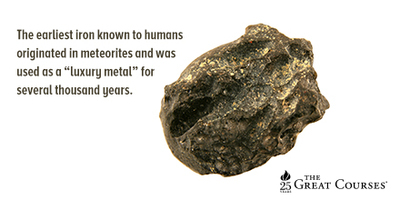 Ever wonder how they were designed and what has allowed them to remain intact? 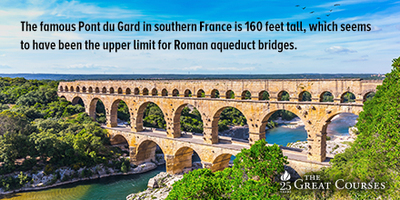 Talk about the civil engineering genius that made these works possible with Dr. Stephen Ressler, Professor Emeritus and a Distinguished Member of the American Society of Civil Engineers (ASCE) on Tuesday, October 13, at 1:00 PM ET. 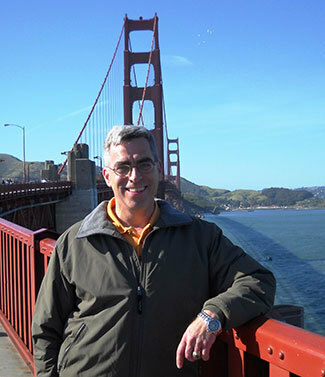 Check out Professor Ressler's courses here. Hello and thank you all for joining us today as we discuss civil engineering with our esteemed guest, Professor Stephen Ressler. At this time, our chat is now open and you may begin sending your questions to Professor Ressler by clicking on the Submit a Question button. Hello, everyone. I’m very excited about having this opportunity to interact with The Great Courses audience. 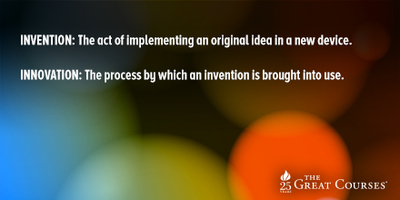 Every teacher loves an intellectually engaged group of students—and you’re as intellectually engaged as they come! Thanks for participating; and thanks to TGC for making this session possible. How is 3D printers and designing software for the masses changing engineering? Loved your presentations on Rome and Greece. Viewing your courses I was amazed at the detailed planning and exacting execution of many of the systems and structures. It seems to me that significant construction duration projects (often decades long), and that the constructors were held to such stringent standards required a centralized and autocratic government. Of course now with computers, modern concrete, and plastics we don't have to spend decades building even the largest structures. But do you think that a democracy… given that we all now much prefer living in a democracy… is even capable of such a sustained effort? I enjoy your lectures. You have inspired me to build some models for classes in Statics and Intro to Engineering. I was wondering if some of the great graphics that you use are available? Your graphics for the Pantheon, Coliseum, and Higia Sophia are great and I only wish that I could develop something that came close to what you have accomplished. I don't get home til after 3:30. Are we approaching an engineering limit on the slender and tall buildings constructed around the world? The bases of these buildings must be undergoing tremendous comprehensive forces due to the height of construction, and some large tension forces with wind loading. What is your perspective on America's infrastructure (roads, bridges, dams, etc); is it as bad as reported in the media? or worse? I watched every lecture! Really enjoyed the development of structures from stone to steel. The examples shown and automated were the best I could ever find. I used much of the information in a course for senior citizens class. It was an amazing course ! In your course on the World's Greatest Structures you discuss how ancient structures were built based on trial and error, institutionalized learning, and the art of engineering. Now that structural engineering is more science based do you feel that some of the "Art" or craftsmanship of the field has been lost? What if any new courses are on the drawing board? We've received an abundance of questions for Professor Ressler, and he has graciously agreed to answer more of your questions within the next week. We will add them to the chat transcript. 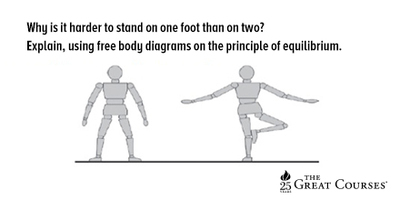 Check back here to see additional questions answered. If you had 2 days in Rome, what would you go see? I've always wondered what goes on 'behind the scenes" at the Great Courses. Do you do all the lectures in one or two days, one after the other, or one a day. How is the editing done? I'm just curious about how it all works. I'll bet others are , too. Tell us some "secrets". Enjoyed your courses very much. Wish you had been an instructor at West Point when I was there. You have a great ability to help people understand the principles. When is your next course coming out and can you tell us the subject matter? 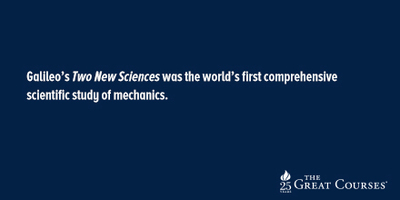 As an engineer (of the chemical persuasion), I greatly enjoyed your courses. I recall that after some serious boiler explosions in schools and similar buildings, the ASME adopted Codes that had a safety factor of roughly 4 to 1. Is it possible to state a similar safety factor for skyscrapers in events like hurricanes and earthquakes? Have there been modern day failures of such buildings? Given your background at West Point, have you ever thought about developing a course on the long history and amazing accomplishments of military engineering? Yours are GREAT Courses - I have all and await more. 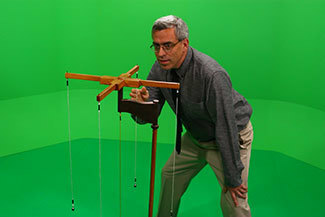 Your grasp beyond just the engineering principles is terrific and does greatly humanize your lectures. More power to you! 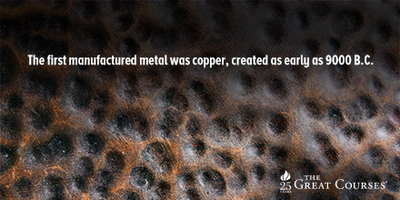 How do you think building materials will change in the future? Is anything being done to make them more environmentally friendly? 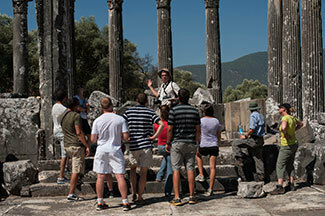 Professor Ressler teaching students at the site of an ancient Roman temple at Euromos, Turkey. 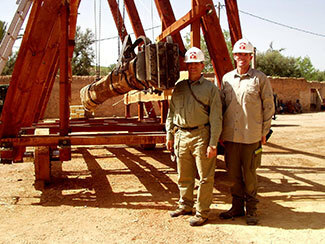 In 2004, Prof. Ressler and two West Point colleagues journeyed to Morocco to design and build a Roman battering ram for a Discovery Channel documentary. 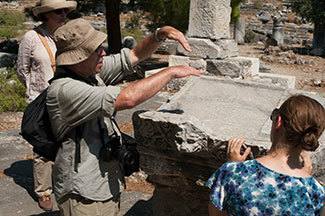 Professor Ressler explains ancient stone masonry during a student trip to Turkey. How did Theodoric's minions get the monolithic dome (10+metres) up on its structure in Ravenna? When did you begin building models for illustrating various concepts? For your West Point classes, or before that? Have you always been a model-builder? 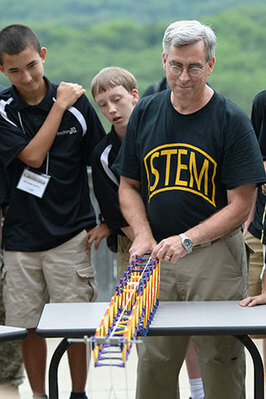 I watched your lecture series again on structures with my 14-year-old grandson who wants to be an ME (mechatronics). The first eight lectures were 'lock and load' for him. 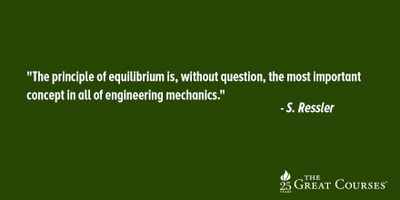 He will be the second ME in our family's 4th generation of engineers. Thanks for your wonderful simplification of a complex subject. 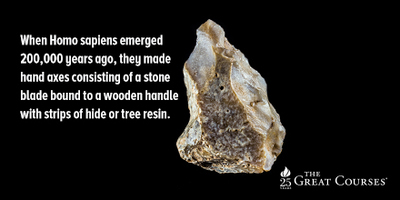 What can we learn from the ancient engineers and technicians that would be of benefit as we tackle today's problems relative to the significant impact modern humans have on our environment? Do you feel that the Great Cathedrals of Europe in the 11th to 15th century were the great architectural and engineering achievements of the western world since Roman times? 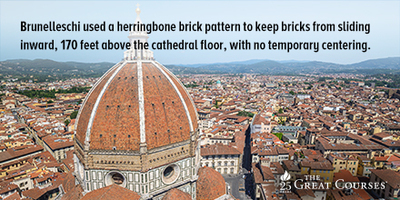 Do you know how the Romans might have used mathematics in their construction? Would their number system have been a hindrance in any way? 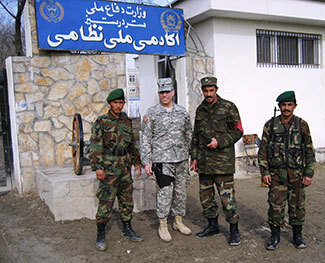 In 2007, Professor Ressler deployed to Afghanistan to develop a civil engineering program for the newly created National Military Academy of Afghanistan. 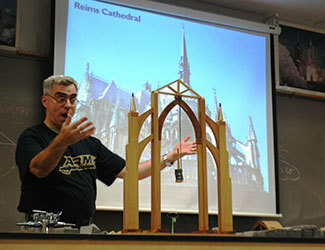 Professor Ressler teaching his favorite subject--understanding the world's great structures. 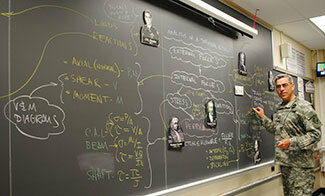 Professor Ressler demonstrates his advocacy for chalk as an effective form of instructional technology. 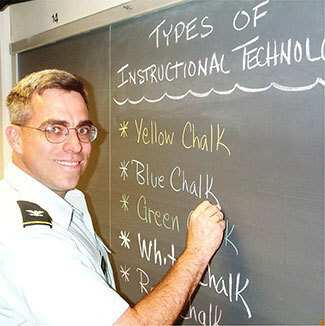 Professor Ressler teaching an introductory course in Engineering Mechanics at West Point. Hey everyone! Thanks for all your participation. We have received so many questions for Dr. Ressler that we are extending this chat for an additional half hour until 2:30 ET. Thanks! 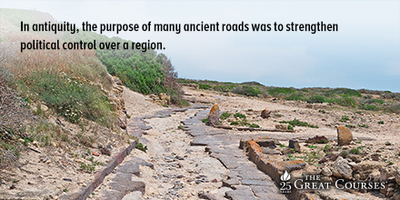 Have you visited or studied any of the structures which are being destroyed in the Middle East? What can be done to preserve their memories? I am nine, and my brother is seven and we enjoy your courses, but when you started your first course did you try to make it a bit less tough so people like me and my brother could understand that type of stuff? France is building a 35 story wooden skyscraper. Portland, OR, is building a 12 story wooden high rise. After what you said in the lecture on the materials used in construction and the limitations of wood, why are these designers going back to wood? Hello Professor. Very much enjoyed your course. It fit in nicely with my volunteer work at the American School of Classical Studies in Athens where I worked with Sherry Fox. You are well-known to many of my colleagues here. I pass the Acropolis daily and continue to be in awe of the structure, the artistic and mechanical achievements, as well as, How did they get all that material up there. Thank you. 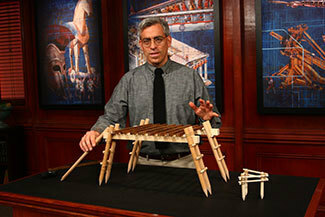 Professor Ressler uses students to demonstrate how an arch works at the great church of Hagia Sophia in Istanbul. When traveling to professional meetings or conferences, Professor Ressler never misses the opportunity for a pilgrimage to a great structure.